The put-in safety talk is an important element in ensuring a successful, safe trip. How extensive it needs to be depends on the group mix. Unless all the trip members boat together frequently and have heard it all a dozen times before, we recommend a complete run-through for everyone. Much of the info you need to cover is serious, but some humor can be used. The goal is to prepare trip members for emergencies that can occur, not to traumatize them! The best policy is to wear your life jacket (PFD) at all times when on the water; emergency situations can develop suddenly. Your PFD is your main safety device, make sure it’s properly fastened and adjusted. It’s safest to wear your PFD while scouting rapids and absolutely essential if you are setting safety at a rapid with a rescue throw bag. When wearing a helmet, also keep it on when scouting. When you remove your PFD at lunch or at the end of the day, be sure to clip it securely to the boat. If it’s loose, a gust of wind or motion of the boat can send it into the water. Whether you’re in an oar or paddleboat, listen to the boat captain. He or she is experienced and will be depending on you to follow directions quickly. Never hesitate to point out downstream obstacles to the captain; they may not have seen them. If you’re new to “reading water”, other experienced boaters will be glad to help you learn. It’s a rough and tumble world out there. Protect your feet by keeping your shoes on while you’re on the water. Getting tangled up in loose ropes and straps can be very dangerous. Keep them properly secured and out of the way. NEVER tie yourself into the boat or tie a line around yourself. Rescuing yourself after you’ve been thrown out of the boat usually presents two choices. If you’re close to the boat and a strong swimmer, you may be able to swim quickly to the boat and get pulled back in. If you’re separated from the boat or in big whitewater, you may have to get through the rapid first. Float on your back with your feet downstream. This allows you to see what’s coming and to push off rocks and obstacles with your feet, instead of your head. Don't lock your knees while floating. Collision with an obstacle can jamb and injure knee joints; plus, locked knees don't allow you to control the push-off from the obstacle. If you're separated from the boat and a good swimmer, sometimes the best way to rescue yourself is to swim aggressively to catch an eddy and get out of water. You can then hike to where a boat can pull into shore and take you on board. In a rescue situation, save the people first and worry about floating equipment later. If you are tossed from a paddle boat, hang onto your paddle if possible; it can be extended out to the boat to help pull you back to it. However, if the paddle is interfering with your swimming and ability to self-rescue, let go of it and take care of yourself. Control your paddle during the chaos of whitewater action, otherwise you can bloody noses and take out teeth of your boating companions. Get back to the boat if you can, but don’t float downstream of it. This creates the danger of being crushed between the boat and an obstacle. If you’re floating through whitewater, breathe in during the wave troughs and hold your breath when the waves break over you. If the boat flips, protect your head from impact with hard objects like frames and oars. 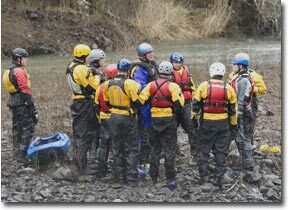 If you come up under the raft, get out from under it quickly, preferably on the upstream side. If possible, climb on the overturned boat and help right it. In the case that you are separated from the boat, float on your back and make your way to shore or another boat. At all costs avoid being swept under a log or “strainer”. If you find yourself going into one, flip onto your stomach, swim hard and get on top of the obstacle. If you go under it, there’s extreme danger of getting trapped underwater. In all swimming situations, keep your feet up to avoid foot entrapment. Only put your feet down in very shallow or very calm water. If the boat strikes a rock, jump to the side nearest the rock. If weight isn’t transferred quickly to this side, water can pile up on the upstream side, force the upstream tube under water and the terrific force of the moving water will “wrap” the boat bottom against the rock. The command is “High side! !” When you hear that, move quickly. Keep your legs inside the boat at all times to avoid getting them crushed between the boat and rocks. When signaling another boat about an obstacle point to the clear path, NOT to the obstacle. Demonstrate the use of throw/rescue bags. Warn against tying the rope to yourself and avoiding entanglement in the rope. Explain how to hold the rope if you’re the one being rescued; to grab the rope, not the bag, and to hold the rope at your chest, lie on your back and kick to assist the rescuer. If you are the rescuer, select a spot that allows you to swing the swimmer into a safe area. Discuss the importance of sun protection and keeping hydrated. 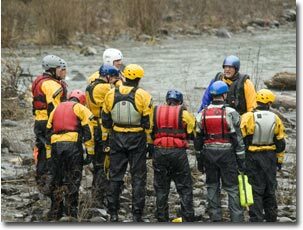 Many accidents occur when getting out of the boat and in scouting rapids. River rocks are often “moss” covered and slippery. Take your time when scouting; often there’s no trail, just rock-scramble footing. If poison ivy/oak grows in the area, make sure everyone knows how to recognize it and knows to quickly wash exposed skin with soapy water if they do get into it. If there are poisonous snakes in the area, be careful where you put hands and feet. Check shoes and bedding for insects, spiders, scorpions etc. When taking side-hikes, carry a first aid kit and be sure to tell others where you’re going. It’s safest to hike with at least one other person. Agree on signals that will be used on the water. Agree on the order and spacing of boats. Rinse feet off before getting in boats. How human waste will be handled on the trip. How bathing, hand washing and dish cleanup with soap will be handled. Stress the importance of washing hands after using the toilet and before handling food. Stress leaving camps cleaner than we find them, picking up micro-trash, not feeding wildlife and recycling cans and plastics. Drink only properly treated water. How fires and charcoal cooking will be handled. Where the first aid supplies are kept.